Judge Wald’s classic article describing the market for judicial clerks reminds us how April was once the cruellest month. Given the Federal Law Clerk Hiring plan has shifted the relevant window of discomfort, we thought it reasonable to ring in the spring season with some of our data on the law clerk tournament. Using underlying information Derek Stafford and I collected for our article Hustle and Flow: A Social Network Analysis of the American Federal Judiciary, here is Federal Court Clerkship data for the period of the “Natural” Rehnquist Court. The current offering is aimed at the US News Top 15 Law Schools. 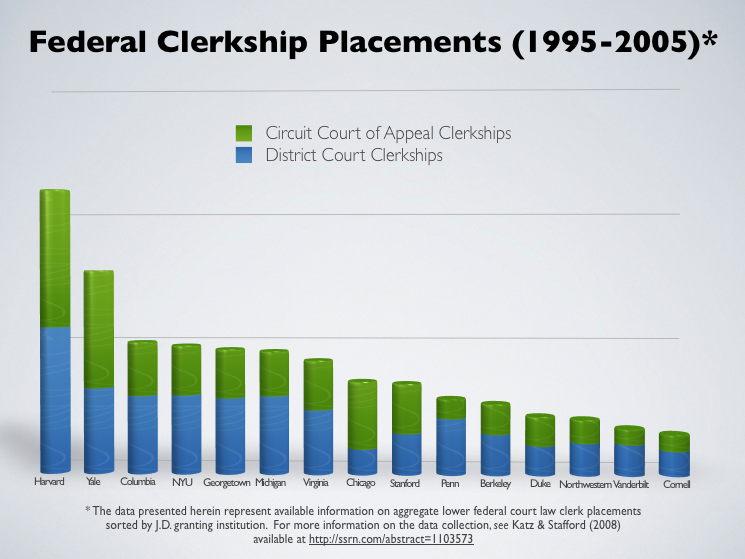 Although this data terminates in the 2004- 2005 clerkship year, we still believe it offers useful empirical insight into the status of the law clerk tournament. It would be good to also present these numbers as a percentage of total graduates from each school during the period in question. @EP — Agreed, for purposes of assessing law schools’ performance in “the tournament.” However, at least in “Hustle and Flow,” Katz & Stafford are, I believe, more interested in the propagation of legal ideas and, further, on influence. Absolute numbers are the more relevant measure for that question.